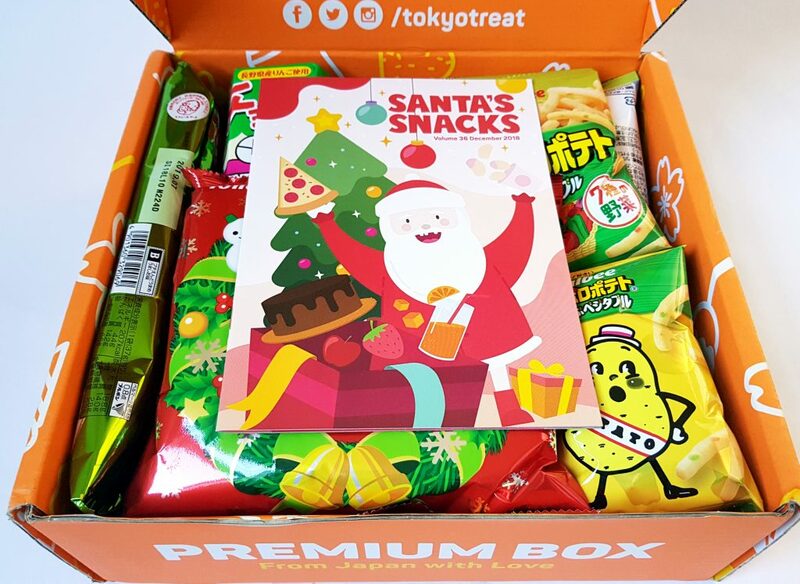 As Christmas is on its way, December’s theme is very appropriate: Santa’s Snacks. 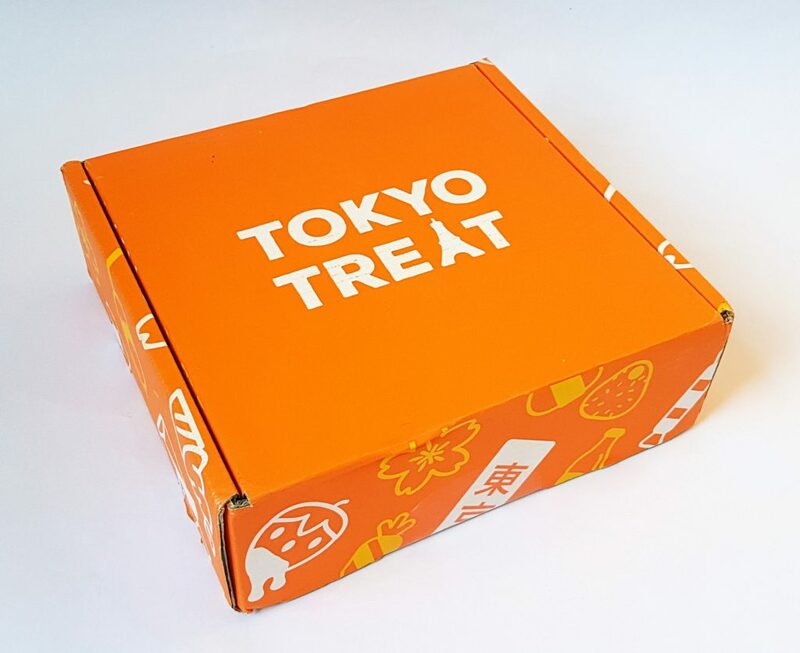 The menu booklet has a welcome note, puzzle, and of course a full list of the box contents. 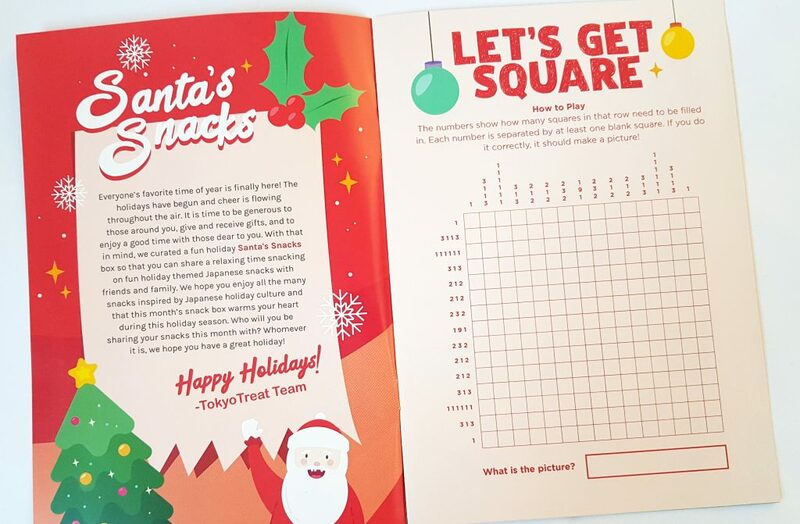 There’s also info about this month’s featured snack, and instructions for the DIY candy kit. 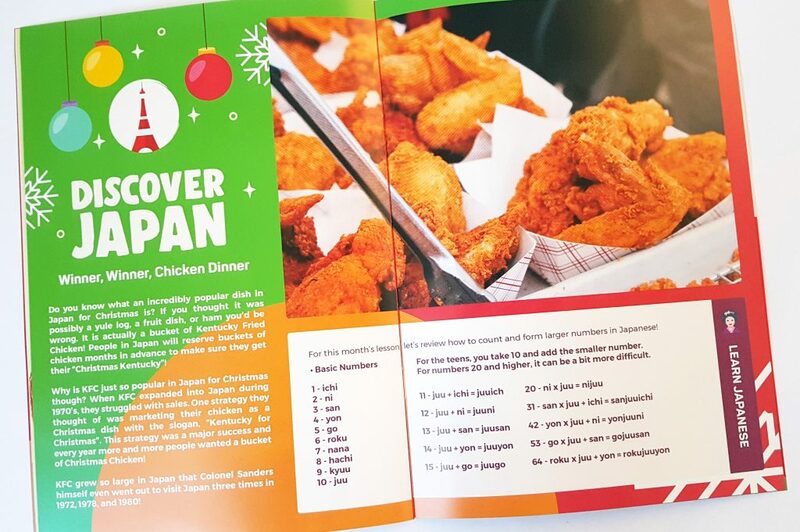 There’s even some fun trivia about Christmas dinner in Japan! 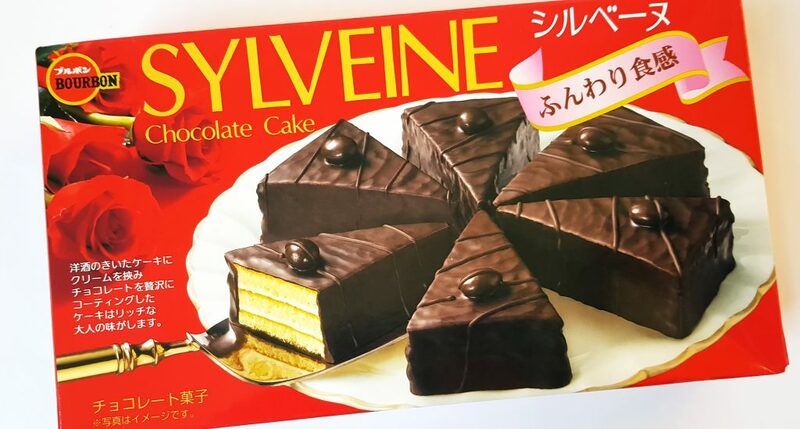 Apparently cake is a popular snack in the holidays in Japan, so this is Bourbon Sylveine Chocolate Cake. It’s a white cake with cream filling and covered in chocolate. 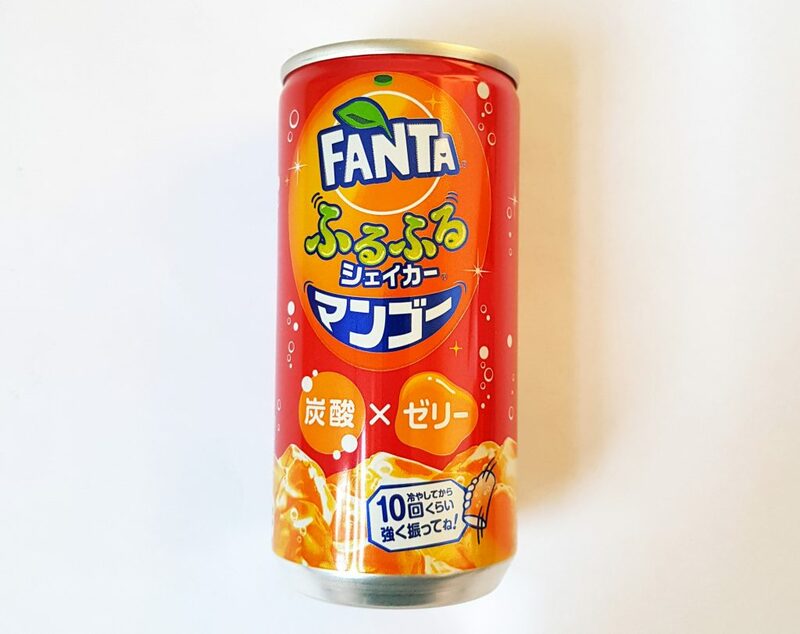 The drink this month is Fanta Mango Jelly Drink. Jelly drinks are common in Japan, and as well as the regular liquid soda also contain pieces of jelly. You shake the can to break up the jelly before you drink it. 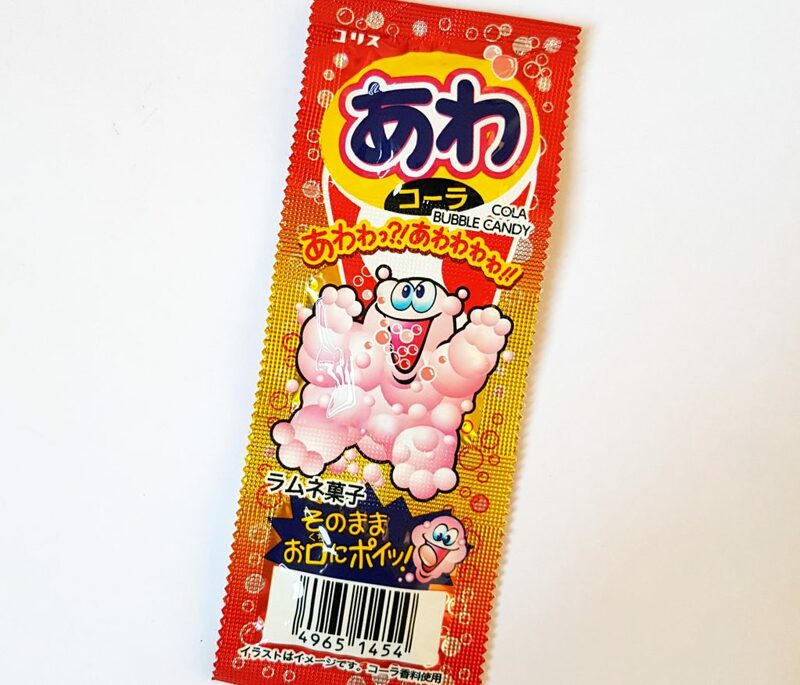 This kawaii snack is a Kumamon White Sesame Cracker. 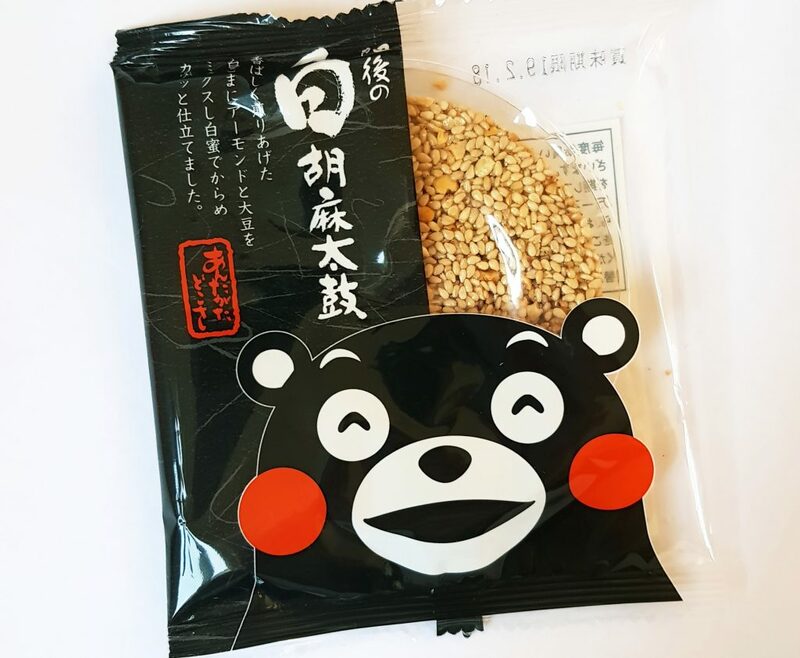 Kumamon is a character by the government of Kumamoto Prefecture, and this type of cracker is very popular in Japan. 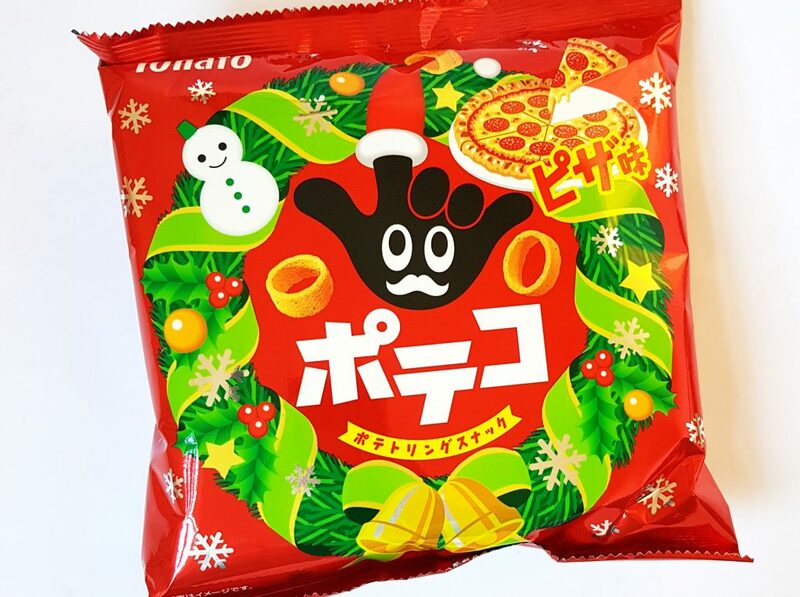 Poteko are little potato rings, rather like Hula Hoops, and this version is a special festive flavour, Christmas Pizza. Perhaps not the most common festive taste, but they’re very nice, and the packaging is definitely festive! Bubbly Cola Ramue Candy is a favorite candy. It tastes like fizzy ramune, Japanese soda pop. 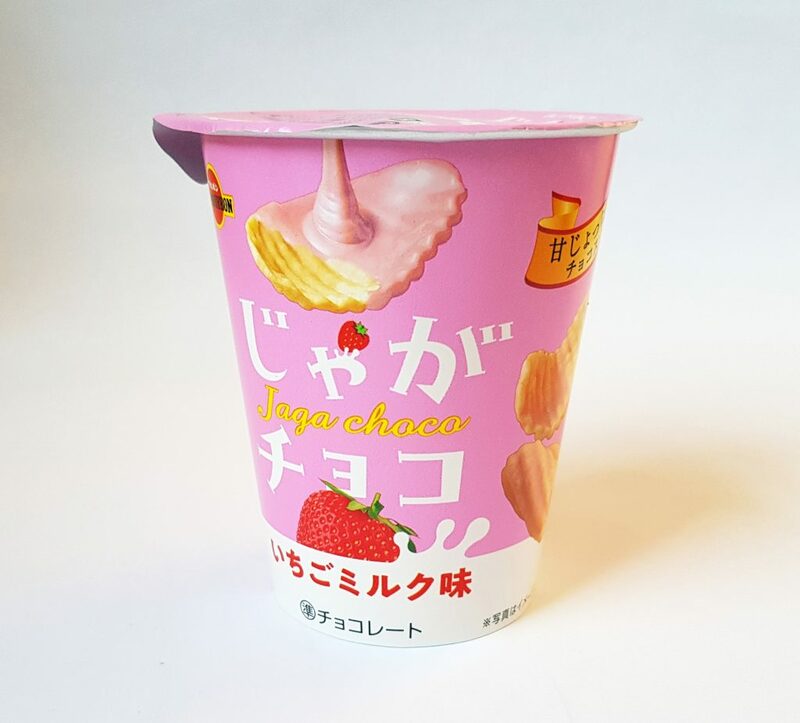 Here’s a really unusual flavour combination, Bourbon Strawberry Chocolate Chips. Salted crisps coated with white strawberry chocolate. It sounds bizarre, but I love sweet and salty combinations, and I think these are amazing! A nice savory snack here, Salty Green Pea Mini Chips. 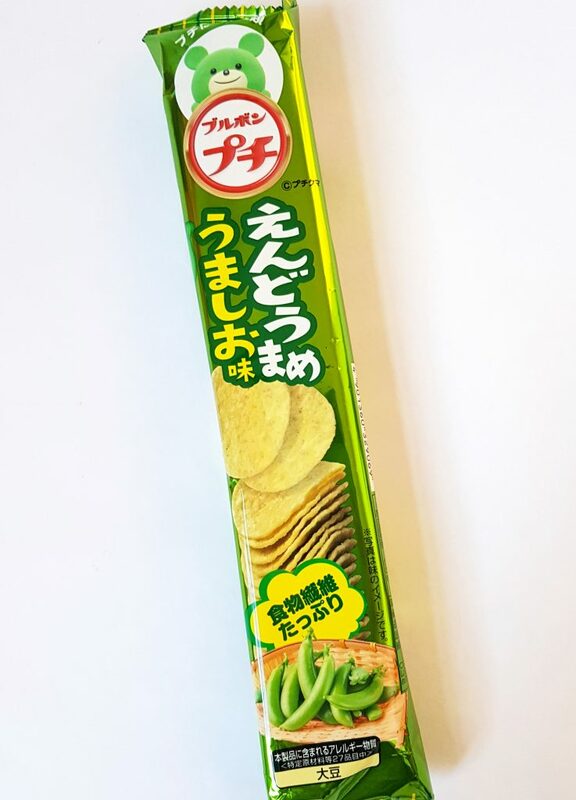 These are a stacking chip rather like mini Pringles, and have a tasty savory flavour that is remarkably pea-like. 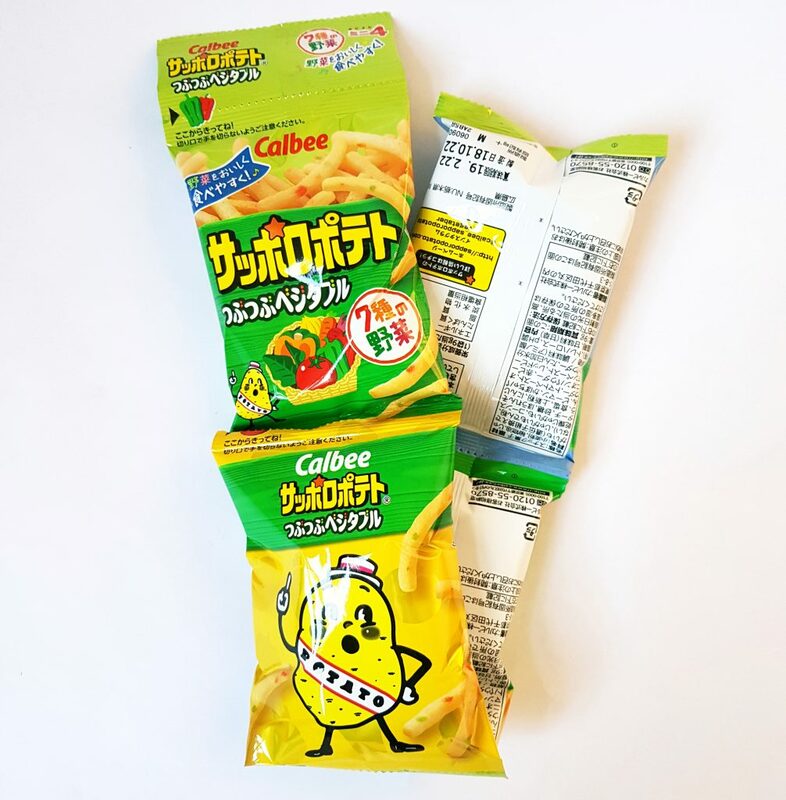 Shin-Chan Apple Chocobi are the latest seasonal variety of this popular corn snack. 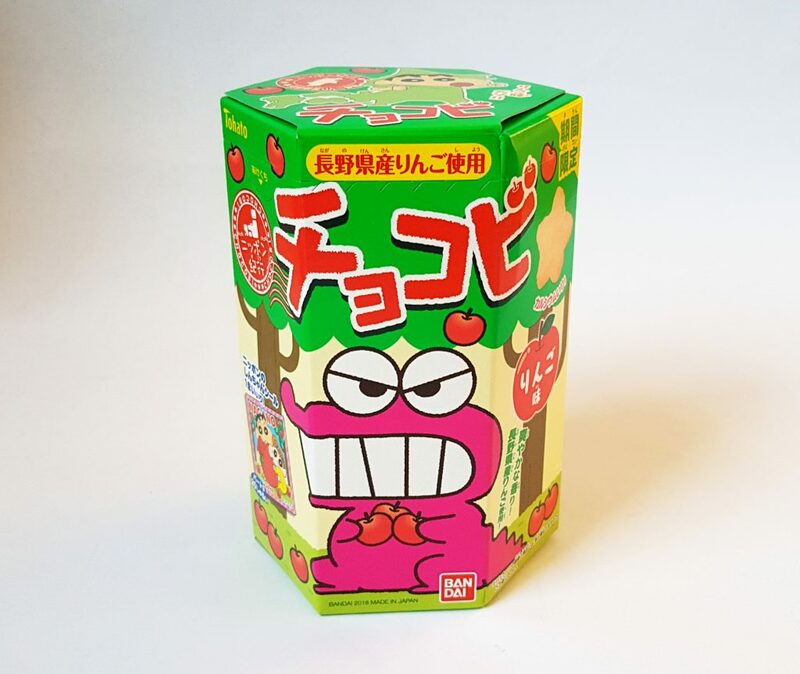 It contains real apple paste from the apples of Nagano prefecture. They’re crispy and delicious, and you also get a little sticker inside the box. No, you’re not getting a fish-shaped lump of coal in your stocking, this is actually Burnt Caramel Taiyaki. 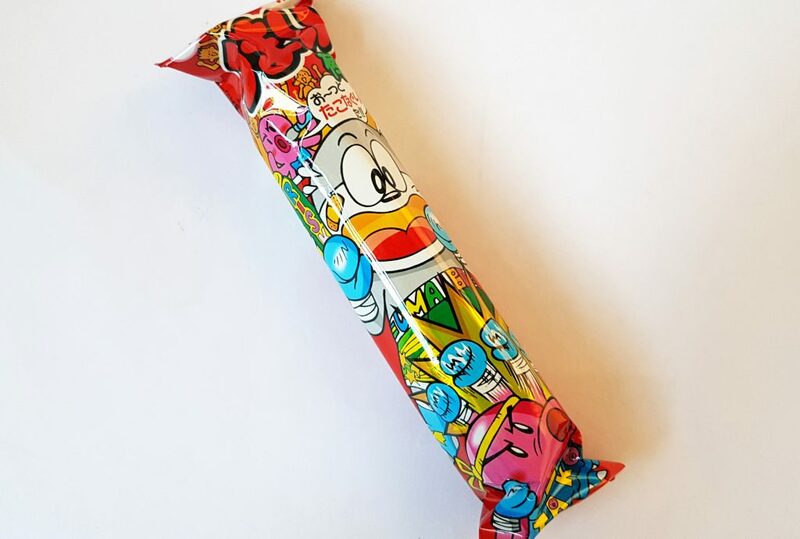 This is a fish-shaped wafer filled with light bubbly chocolate. It comes in several different varieties but this is a new version with the taste of burnt caramel. Burnt in a good way though. This month’s share pack are Vegetable Potato Sticks. These crunchy potato sticks contain nine different vegetables, so you can believe they’re healthy! 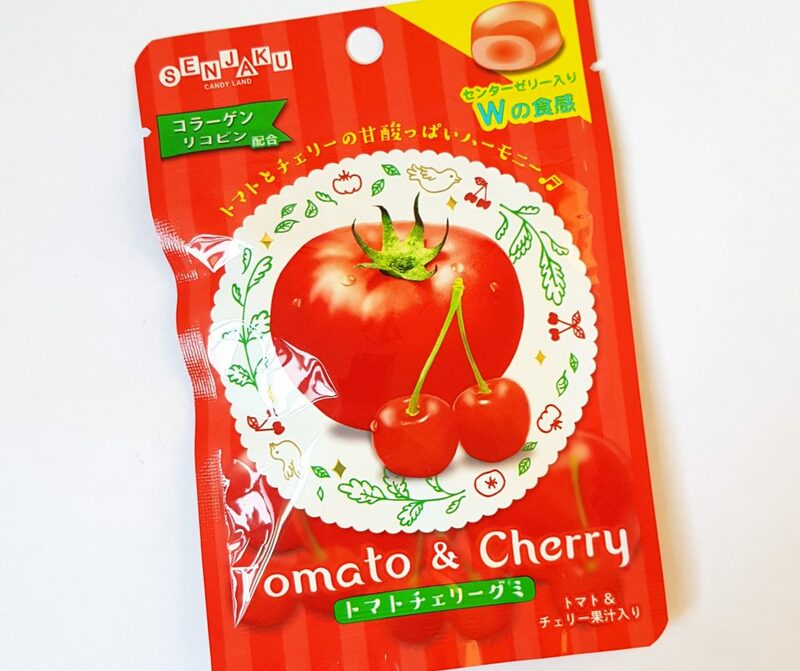 Tomato & Cherry Gummies are this month’s featured snack. These didn’t sound too appealing, mainly because I don’t like really like tomatoes, but somehow the two flavours work together pretty well. Not a flavour combination I ever thought I’d try though! 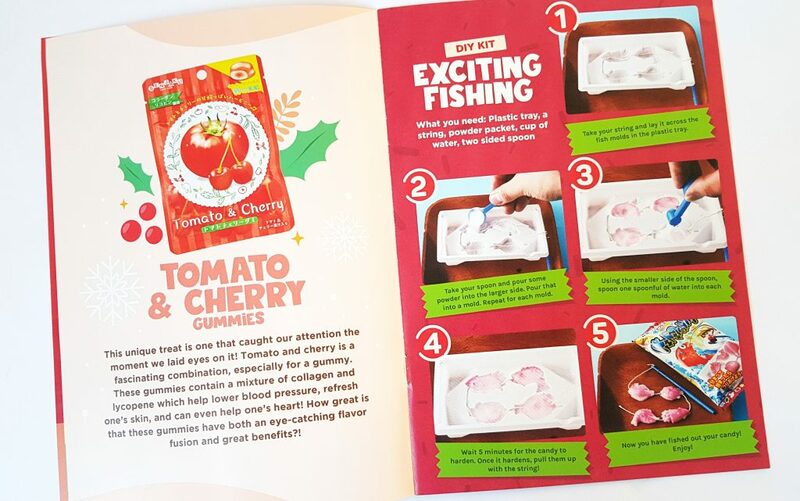 This month’s DIY candy kit is called Exciting Fishing. It contains powder, molds, and a little fishing rod and string. 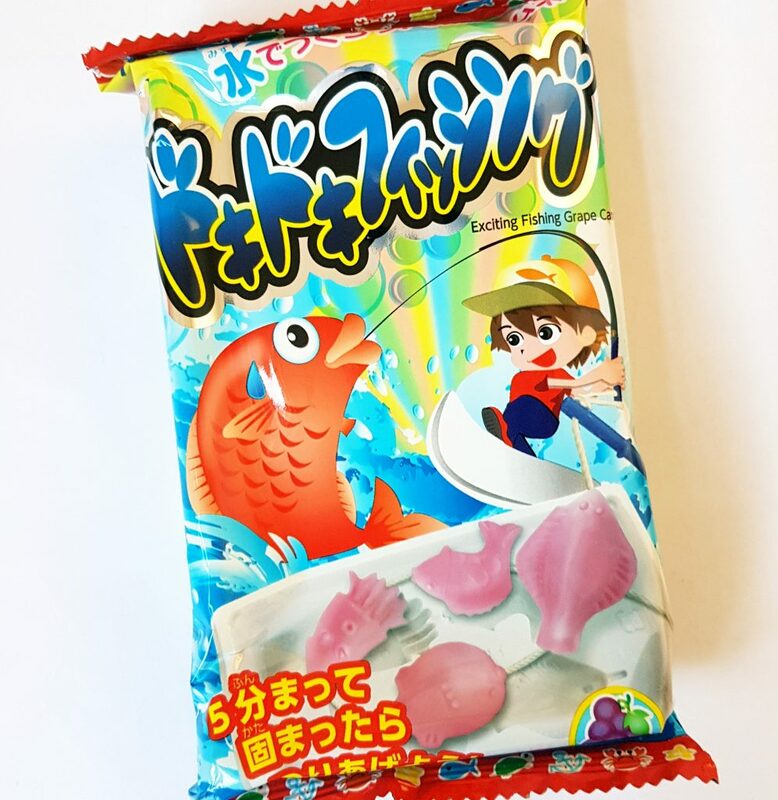 You add water to the powder with the string inside, and the candy hardens into little fish shapes on a fishing line. Very cute! The Umaibo this month is Takoyaki Umaibo. Takoyaki is a popular snack of balls of fried octopus. I’m sure it’s delicious, but sadly I can’t eat this one because I’m allergic. A great shame as I adore Umaibo. Finally, a Melon Bread Cookie. 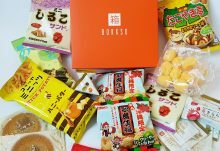 Melon bread is very famous in Japan, and this cookie has a remarkably distinctive melon taste. A little treat for Santa perhaps? 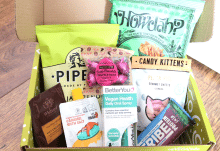 This box has some lovely things in it, and is especially good on the more unusual flavours. 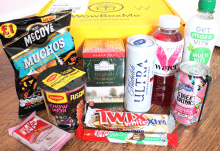 There are definitely some combinations I would never have thought of, so this is a great way to discover new tastes! Japan doesn’t exactly celebrate Christmas, though as you can see, you can get some festive things. 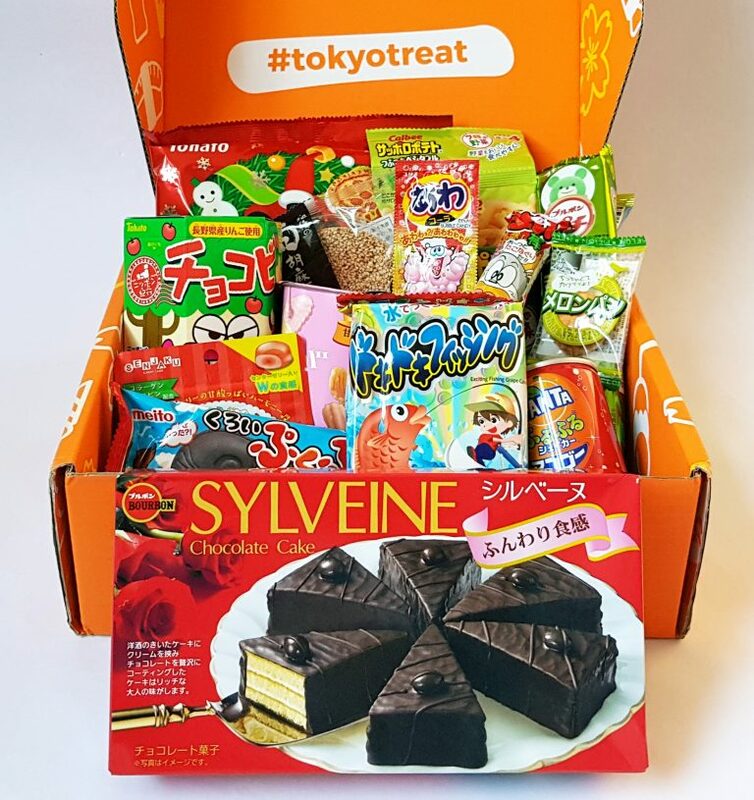 I think TokyoTreat has done pretty well finding some seasonal items, and adding a bit of a twist, especially with the black fish wafer snack. Everything is delicious and interesting, and these would make some great stocking fillers, especially for people with adventurous tastes! 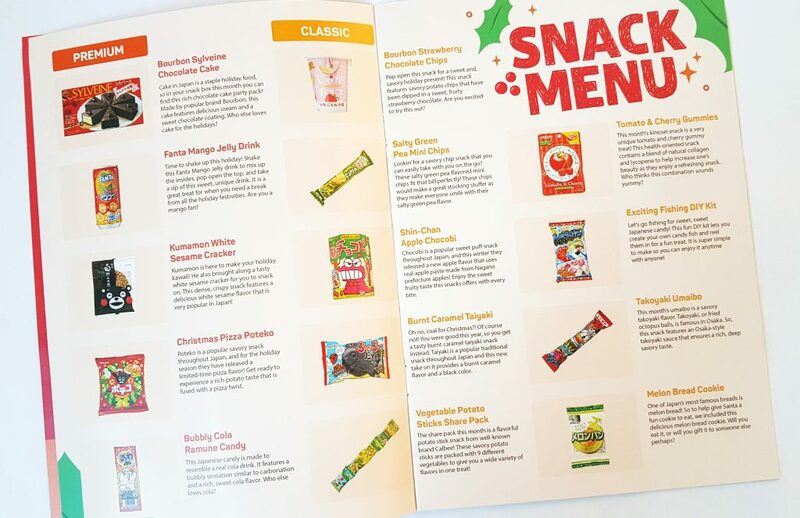 These snacks will give you festive treats and unusual flavours this Christmas!